Yasser Abed Rabbo - Who is Yasser Abed Rabbo? Born in Yaffa in 1945, Mr. Abed Rabbo has a B.A. in economics and political science from the American University in Cairo. He actively engaged in the Palestinian resistance movement after the June 1967 Israeli occupation of the West Bank and the Gaza Strip. He was a leading member of the Popular Front for the Liberation of Palestine (PFLP). He participated in establishing the Democratic Front for the Liberation of Palestine (DFLP) in 1969, which was considered the moderate wing of the PFLP. He was among the first undertakers to call for historical reconciliation and the establishment of an independent state of Palestine based on the 1967 borders, with east Jerusalem as its capital, alongside Israel. Abed Rabbo became a member of the Palestinian National Council (PNC), and he was the leader of the DFLP delegation in the PNC since 1969. He was elected deputy secretary of this party. He has been a member of the Palestine Liberation Organization (PLO)’s Executive Committee since 1971. He has also acted as head of the PLO Department of Information and Culture since 1974. He participated in drafting the political agenda of the PLO since 1974, including the Declaration of Independence and the Palestinian peace initiative in 1988, which called for a two-state solution and accepted UN resolution 242 as a basis for ending the conflict with Israel. Abed Rabbo played an important role during the reunification of the PLO in 1987, after its split in 1984. After the US agreed to open dialogue with the PLO in 1988, he headed the first delegation to this dialogue, which was launched in Tunis on December 15, 1988. He participated in Arab Summit meetings since 1972, and participated in drafting political decisions in the 1974 Rabat Summit, which acknowledged the PLO as the legitimate and only representative of the Palestinian people. He played an active role in the Palestinian political arena wherein he relayed the PLO’s stance and supported its realistic methodology for more than three decades. As a member of the negotiations committee, he overlooked preparations for the Middle East Peace Conference in Madrid in 1991. He also participated in the team that negotiated secretly for the Oslo Accords in 1993. In 1990, he headed the Palestinian Democratic Group, FIDA, a party which broke away from the DFLP. He resigned this post in 2000. 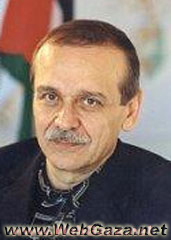 Abed Rabbo became Minister of Culture and Information in the first Palestine National Authority (PNA) government in 1994, where he prepared the first law that guarantees the freedom of the press. He also attained several achievements in the cultural field, including the formation of a number of cultural institutions, mainly building the Ramallah Cultural Palace, and paying close attention to child and women’s culture. He also established the annual “Palestine Prize for Culture.” Moreover, he encouraged the establishment of private radio and television stations and protecting them from government intervention. He also launched a campaign for book fares and cultural festivals throughout the Occupied Territories. Since 1994, he participated in all negotiations to implement the Oslo Accords and led the Palestinian delegation to the Permanent Status negotiations in 1999-2000. Moreover, he participated in the negotiations at Wye River in 1998, Camp David in 2000 and Taba in 2001. He led informal negotiations with an Israeli group headed by Yossi Beilin in 2001 to complete what was not achieved at Taba, which yielded the “Geneva Initiative” in October 2003. The initiative is the first Palestinian-Israeli document that lays out a detailed, comprehensive solution to all permanent status issues, among them, Jerusalem, refugees, settlements and borders, based on an end to the Israeli occupation, the establishment of an independent Palestinian state, with East Jerusalem as its capital, according to the 1967 borders, and finding a just, agreed-upon solution to the problem of Palestinian refugees. He became Minister of Cabinet Affairs in the government of Mahmoud Abbas (Abu Mazen) in 2003, and he participated in the Sharm El-Sheikh Summit and Aqaba throughout. He headed the Palestinian Ministerial Reform Committee (MRC) in 2002 and participated in creating the post of prime minister and in carrying out a number of administrative reforms in PNA institutions. In 2001, he participated in creating the “Palestinian Peace Coalition,” which he currently heads. The PPC is a coalition which encompasses representatives of civil society as well as governmental and non-governmental figures. Abed Rabbo lives in the occupied West Bank city of Ramallah.